Brush the wonton wrappers lightly with oil, stack two together turning the top one a quarter turn so that the basket has 8 points; fit into a mini muffin tin. Bake at 375° F for 7 minutes. Can be made 2 days in advance, covered and stored at room temperature. Pierce sweet potato several times with fork and place on a plate. Microwave for 5 to 6 minutes. When cool enough to handle, scrap out pulp into a bowl. Add butter and raw sugar. Mash with a fork. 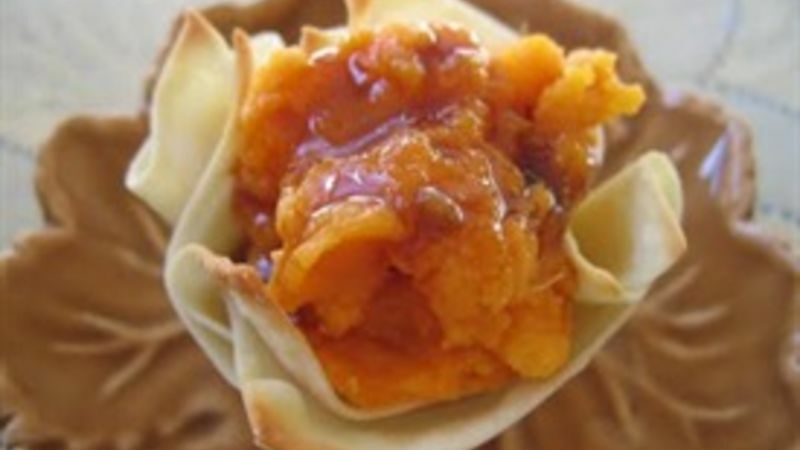 Fill wonton baskets with about 1 tablespoon of sweet potato. Mix Jack Daniel's™ with brown sugar and molasses. Dribble about 1 tablespoon on top of sweet potatoes. Serves 8.